Between January 1788 and January 1868, 163,021 men, women and children were transported to the British colonies of New South Wales, Queensland, Western Australia, Tasmania (known as Van Diemen's Land until 1856) and Victoria. Very few convicts were sent to Victoria and none to South Australia. The colonies later joined together to become Australia. Only some convicts were guilty of serious crimes, others were simply the poor, the desperate or the politically inconvenient. Very few returned to Britain when their sentences expired - even those who had the resources to pay for a passage home recognised they could build a better future in this new country. 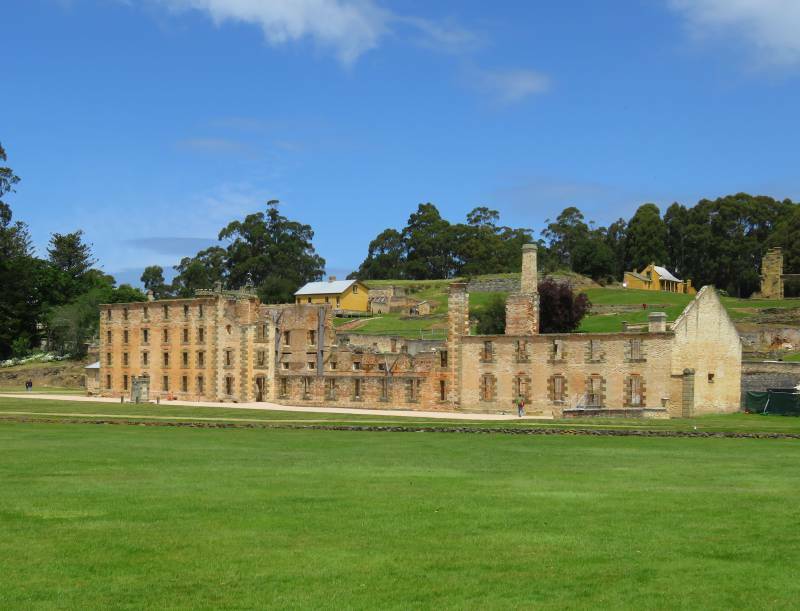 The World Heritage-listed Port Arthur Historic Site in Tasmania is Australia's most intact convict site. David and I both visited Port Arthur as teenagers in the 1970's. We came back in the 1990's with our two young boys and again a few weeks ago. I can't remember whether there was a fee to enter the site in the 70's, but I do remember there were no queues, tours, audio-visual presentations or modern visitor centre. You just parked your car and wandered around trying to imagine what it must have been like for the poor souls who were condemned to live and sometimes die there. Today Port Arthur has become a tourism behemoth drawing hundreds of thousands of visitors from around the world each year - they arrive by car, bus and even cruise ship. Somehow amid all this Port Arthur has managed to retain its character and charm. David and I got lucky and went on a day when there was no cruise ship anchored in the bay. I am not sure we would have been quite so impressed had our visit coincided with thousands of cruise ship passengers. 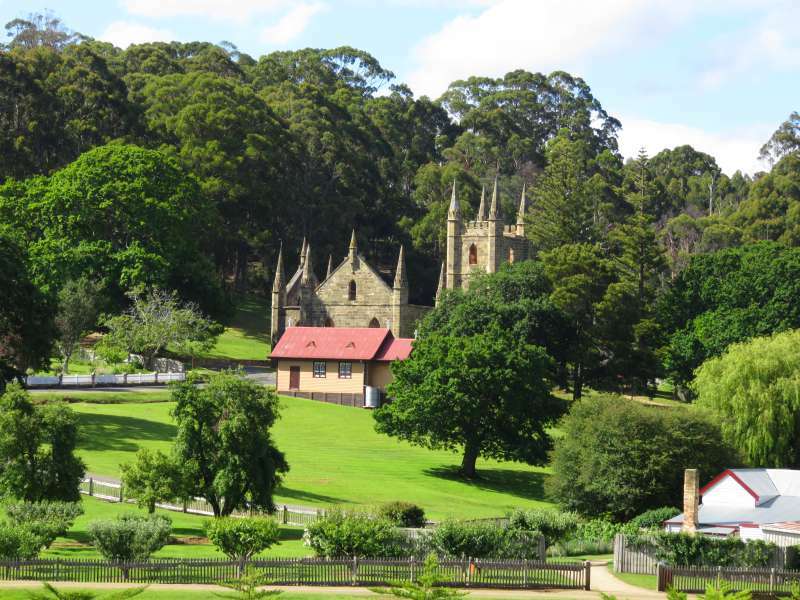 Port Arthur was established in 1830 for the purpose of producing timber to supply government construction projects. From 1833 it became a penal site for repeat offenders - those convicts who had committed a new transgression after being transported to one of the other penal colonies. By 1840 more than 2000 convicts, soldiers and non-military staff lived at Port Arthur making it a thriving, if brutal and depressing, community. 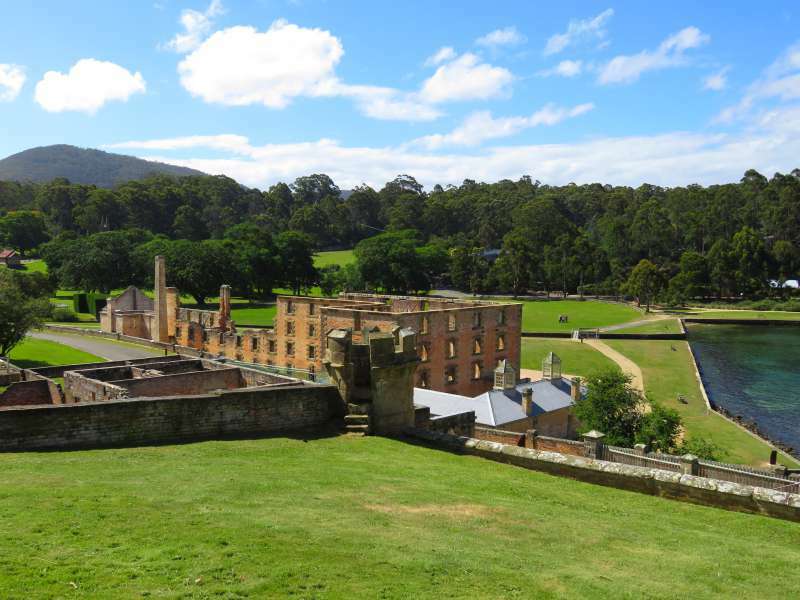 In 1853 transportation to Tasmania ended and Port Arthur became an institution for old and infirm convicts. It finally closed in 1877. Although many of the buildings were torn down or damaged in bushfires, enough significant structures remain today to make it a fascinating place to visit. Entry tickets are valid for two consecutive days. 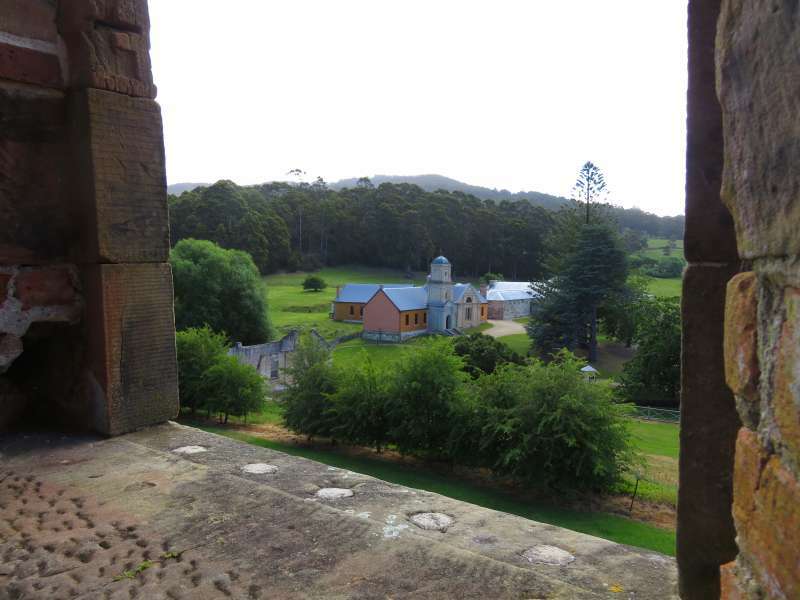 There is not much accommodation nearby however Port Arthur is only an hour and a half from Hobart by car, making it easy to visit in a day trip from the capital. We purchased our tickets in Hobart the day before our visit on the promise that this would let us skip the queue at the entrance. It didn't - in fact the queue to convert our tickets into entry passes took longer than the general queue. Our general entry tickets included a 40 minute guided walking tour. It is worth doing the tour early. It gave us a feel for what life was like at Port Arthur and made wandering around the site on our own later in the day much more interesting. Also included in the general entry price is a 25 minute boat cruise around the bay. The Captain on our cruise must have been a comedian in another life - he kept up an hilarious commentary peppered with anecdotes and jokes. It was worth doing the cruise just for this. The cruise goes across the harbour to the site of Point Puer boys' prison and the Isle of the Dead. Between 1834 and 1839, 3000 boys were imprisoned at Point Puer - the youngest boy had just turned nine years old. The Island of the Dead functioned as Port Arthur's cemetery. More than 1,000 people both convict and free were buried there. You can only go ashore at Point Puer and the Isle of the Dead if you have tickets for the additional tours which go to them. The Point Puer tour takes about two hours and the Island of the Dead tour takes about an hour. David and I did the Isle of the Dead Tour. Standing on a speck of dirt in the middle of a bay deep enough to anchor modern day cruise ships, knowing the bones of 1,000 men, women and children were beneath our feet was sad - and not just a little bit creepy. The Island is littered with headstones, only a very small number of which mark convict graves. 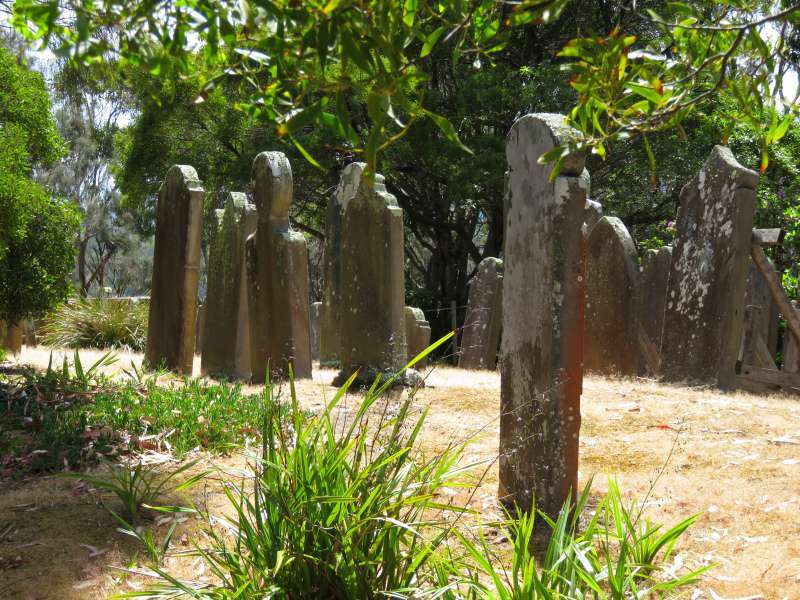 Almost all the convicts were buried in unmarked graves - so be careful where you tread. Gravestones on the Isle of the Dead. 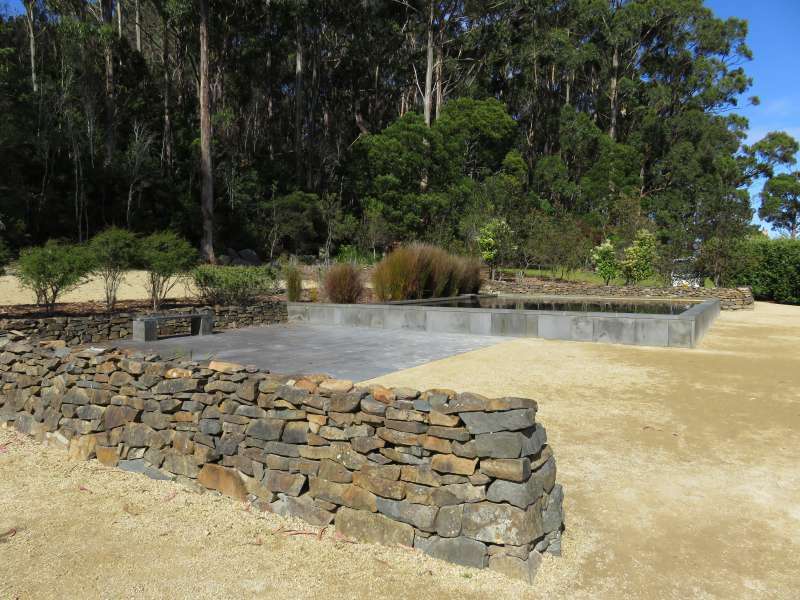 On Sunday 28 April 1996 Martin Bryant, a 28 year old resident of Hobart, murdered 35 men, women and children and wounded another 19 at Port Arthur in what was one of the worst shooting rampages by a single person in the world. The massacre prompted the introduction of Australia's strict gun control laws. The laws were introduced with bipartisan support. Tucked away behind the wharf and almost out of view is a Memorial Garden in memory of the victims of the massacre. It is on the site of the ruins of the Broad Arrow Cafe where 20 people were killed. Try to leave yourself at least half a day to visit Port Arthur. 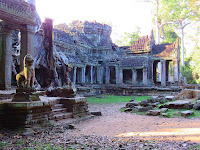 It is a large site incorporating more than 30 historic buildings, ruins, gardens and museums. 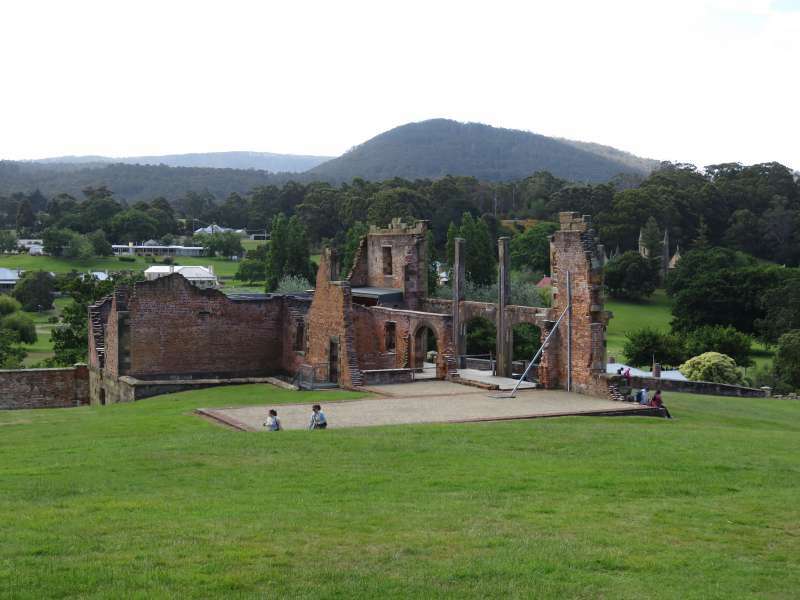 Port Arthur is about one and a half hours drive from Hobart. The Isle of the Dead Tour was worth the extra cost, if only for the fact that I would have been disappointed to sail straight past the island and not be able to land. Take a jacket. Port Arthur is on a peninsular and can get cold, even in summer. It is probably worth buying your tickets online, or in person at Hobart, before your visit. In the end I don't think it would have made much difference to us but at least we didn't have to stress about missing our preferred times on the walking tour and the Isle of the Dead tour. For an additional cost of $6.00 you can rent an iPod pre-loaded with an audio tour. David and I rented one each. I used mine extensively and found it was well worth the extra cost. It brought the site to life with personal reminiscences, photos and snippets of history. David hardly touched his, preferring to read the information boards instead. If you own an iPhone or iPod Touch you can download the tour for $2.99. Entry prices are $37(adult), $17(child), $90(family) and $28(concession). The entry is valid for two consecutive days and includes the 40 minute walking tour and the 25 minute harbour cruise. Entry plus one of either the Isle of the Dead Tour or the Point Puer Boys' Prison Tour is $50(adult), $27(child), $125(family) and $45(concession). Click here for a complete list of ticket prices. I publish a new post each Thursday or Friday, depending on your time zone. If you would like to follow our travels, check back each week or enter your email address in the 'Never miss a post: Follow by email' box in the right hand sidebar just below my profile picture. I did not know that Tasmania was used for penal colonies. Port Arthur sound fascinating. Next time you are in Australia you should go to Tasmania, it is a great destination. You can even go to Port Arthur on a cruise - I know you are a cruiseaholic. You have to pick you time of year though. The weather can be difficult. It is not a fort but it is just as interesting - even more so. I am a great fan of forts but we don't have them in Australia. Most Australians who have convict ancestry are quite proud of it but it is fairly uncommon. It is hard to believe that boys so young could be sent to prison at all, let along halfway around the world. I know what you mean about commercialisation but fortunately that hasn't been an issue at Port Arthur. Although it is a lot more expensive the experience of going there has improved since the 70's. Really interesting - I didn't know that there were penal colonies on Tasmania - to be honest I assumed they were in New South Wales. About time I learnt more about Australian history I think. Would visit Port Arthur. I am not surprised you thought the penal colonies were only in New South Wales. When it was first settled New South Wales covered most of eastern Australia so people tend to think of it as the place where convicts were sent. It has been a while since we were in Port Arthur, but always found it quite a disturbing place. It is sad but also fascinating. I prefer audiotours to reading info boards as I like to gaze upon the subject as I'm learning about it. I'll admit that I'm one of the foreigners who believed that Australia was predominantly settled by convicts. Thanks for correcting me. Port Arthur seems like a very interesting place, and that Isle of the Dead seems a bit spooky. Not sure if I'd convince my youngest to disembark there. Haha - your youngest might love it, you never know! Lyn I still haven't made it to Tassie, but when I do Port Arthur is top of my list. Thanks for reminding me it's still on my to do list. We had a great time in Tasmania, I am sure you would love it. 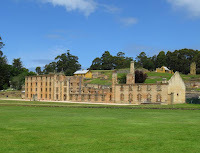 Port Arthur looks like a thought provoking place to explore some of Australia's past. Thanks for linking up with #wkendtravelinspiration! Lyn I found it fascinating to hear more of the statistics regarding convicts in Australia and Tasmania. When we visited Tasmania the people we spent time with seemed very proud of their heritage. As always with your posts i find the tips section particularly helpful for those who follow in your footsteps. Most Australians who have a convict in the family tree are proud of it. Like Canada and America, Australians admire the way their forebears overcame adversity to establish our country. Make sure you let me know if you are ever in Oz. I will show you around Sydney. I recently read A Commonwealth of Thieves, about the colonizing of Australia and Tasmania. Quite fascinating. Interesting to know there are remnants of this history left. I have never heard of 'A Commonwealth of Thieves'. I am going to look it up and get a copy. The book most Australians think of when they talk about the convict days is 'The Fatal Shore' by Robert Hughes. Unfortunately it contains a fair number of inaccuracies including a story about the suicide of two young boys at Port Arthur. It is a great read though as long as you take it with a grain of salt. Your description of Port Arthur in Tasmania reminds of Alcatraz Island in San Francisco, California. There's something about an old prison: you can almost smell the despair. I hadn't thought about the parallels with Alcatraz but I know what you mean. There is something about old prisons which make them compelling places to visit. 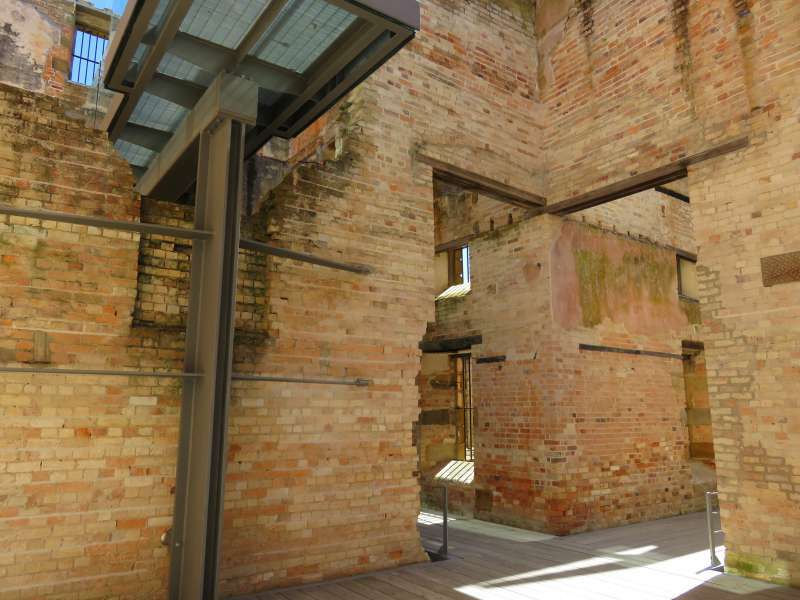 it's great to learn about the early history of Port Arthur. Unfortunately the 1996 killings seem to have overshadowed this. We didn't make the day trip when we were in Hobart but it's one I'll have to take next time. For many years I think the massacre did cast a shadow over Port Arthur but I don't think that is the case so much now. You show us all the reasons why, after 'official retirement', we will have to continue our overland travels in Australia. There's so much more to explore, even though I've been at least one time around the mainland - something not that many Australians can claim. But boy - these 'concession prices' are a bit steep, aren't they? The older I get the more I appreciate Australia and all it has to offer. I know what you mean about the prices though. Unfortunately high admission prices are routine in Oz now, almost no matter where you go. I'm putting in on my list. I visited this place almost 10 years ago. I was a backpacker from The Netherlands. Such an amazing place and impressive to see! I hope you enjoyed the rest of Australia as much. My maternal grandfather's grandmother was transported from Skye to Van Diemen's Land on one of the last convict ships to arrive, with at least two of her 'babes in arms' Her crime? 'Reset of Sheep' in other words, her young son killed a sheep because the family was starving, and his mother butchered it. Sentence: 7 years transportation. I hope she found a better life in Australia than the one she left at home. It must have been a frightening thing to be transported, but many convicts gained 'tickets of leave' not too long after arriving in Australia, notwithstanding their long sentences. They were essentially free - they just couldn't return to Britain until their original sentence expired.